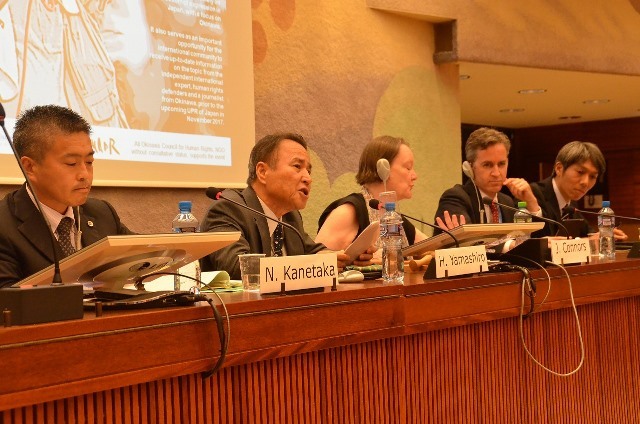 On Friday 16th June at the 35th session of the UN Human Rights Council, the International Movement Against All Forms of Discrimination and Racism (IMADR), jointly with Amnesty International and Franciscans International, held a side event titled “Freedom of Expression in Okinawa, Japan”. The All Okinawa Council for Human Rights also supported the event. Video of the event is available in Japanese. The event was moderated by Ms. Jane Connors, Director of International Advocacy of Amnesty International. 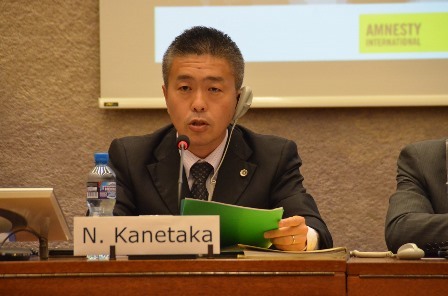 Following three civil society representatives from Okinawa, Mr. Nozomi Kanetaka, Mr. Hiroji Yamashiro, Mr. Takashi Abe, the UN Special Rapporteur on the promotion and protection of the right to freedom of opinion and expression, Mr. David Kaye, shared his views on the situation in Okinawa based on his country visit in April 2016. In her opening remark, Ms. Connors explained to the audience that the Special Rapporteur’s report addressed the situation in Okinawa in the context of public demonstrations, especially the arrests and 5-month detention of Mr. Yamashiro. She expressed concerns on chilling effects on civil society by the arbitrary detention of Mr. Yamashiro. After the short introductory video, Mr. Kanetaka pointed out the arbitrary nature of Mr. Yamashiro’s arrests and detention. He explained the three allegations against Mr. Yamashiro which were brought in two months: cutting a barbed wire; injuring an officer of the Okinawa Defense Bureau (ODB) and interference with official duties: and the obstruction of business by piling up concrete blocks at the gate of Camp Schwab US Marine Corps base. Among those, Mr. Yamashiro pleaded guilty only for the destruction of property, but not the others. He insisted that laying concrete blocks was a legitimate protest activity. Mr. Kanetaka stressed that the protest in Okinawa is non-violent, and protesters make sure that their sit-in demonstrations do not obstruct emergency vehicles. He pointed out that the Okinawan people feel discriminated by the heavy burden of U.S. military bases, therefore their protest activities against the new base construction must be guaranteed as freedom of expression. However, the police have deployed massive forces in Okinawa from the mainland. They remove sit-in protesters by force which has caused injuries of protesters. Many protesters were arrested for minor allegations like blocking the traffic, and they were released one or two days later without charges. He criticised those arrests as unnecessary measures. He expressed concerns on video surveillance on protest by the police and defence bureau officials. The ODB installed a CCTV by the Camp Schwab gate and films protesters. He shared concerns that those arrests and surveillance prevent people from joining the protest and spread chilling effects. 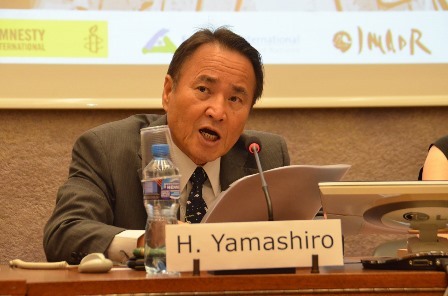 Addressing further on Mr. Yamashiro’s case, he raised the Japanese criminal system’s fundamental problem which was once described as “the Middle Ages” by the UN Committee Against Torture. He highlighted the fact that Mr. Yamashiro had not been allowed to see nor receive letters from anyone including his family and others for almost 5 months. Only lawyers could communicate with him in detention. He described the prolonged detention and treatments “extraordinary”. He reiterated that the prolonged detention was unjust, which spread chilling effects among protesting civilians. He also added that the “anti-conspiracy” bill passed in the Parliament on 15 June is feared to restrict freedom of expression and right to privacy. Mr. Yamashiro started his intervention from the historical background of Okinawa in order to explain why the Okinawan people are protesting against the military facilities. As the Japan’s final battlefield during the WW2, Okinawa experienced a significant loss of life, but it continues to be considered as the main defence point for the Pacific. 20% of the main island is occupied by the U.S. military facilities which have been a cause for noise pollutions, aircraft crashes, environmental destructions, sexual violence, assaults and murders by foreign military personnel, as well as impediment for economy. He shared a tragic case of the murder of a 20 year-old woman by a former marine in 2016. He regretted that although the Okinawan people have expressed their opposition to the new base construction in local and Prefectural elections, it continues to be ignored by the Japanese government. Large police forces have been deployed to remove protestors by force. For example, in June, a woman was thrown on the road which caused a depression of her skull. He called for immediate stop of violent policing. He moved to testify about the 5-month detention he faced. In addition to what Mr. Kanetaka explained, he was asked by prosecutors to confess, provide the names of others protesters and give up the protest. He expressed his anger for the lack of due process in detention such as the limited contacts with lawyers and no access to video evidences submitted by prosecutors prior to the court hearing. He expressed concerns that other protestors may face similar treatments in future. He recalled that he was not allowed to see his doctor in detention, despite the fact that he is recovering from the last stage of malignant lymphoma. When his tooth got caries in detention, he was told that it would not be treated but extracted. He recalled a painful experience in the cell in which the light was not turned off in the night and no clock was there. Although the detention centre allowed him to read newspaper and books, letters were banned. He shared his surprise about receiving over 500 letters on the day of his release. Those letters were sent within and outside Japan during his 152 days of detention, but the authorities kept them from him. He expressed appreciations to his friends, academics, civil society organisations and the UN Special Rapporteurs that joined the call for his release. He also thanked the Okinawan media that reported about the detention. He called on the Japanese government to respect the Okinawan people’s will against the new base construction, cease violent policing, and respect freedom of expression, press, assembly and association. Mr. Abe started his intervention by describing what the Okinawan media have been reporting on the military base construction site. First, the media repot violence against protesters by Japanese police, coast guards, and the U.S. Forces which the previous speakers also mentioned. The media also cover the issues of environmental destructions such as deforestation and damages to coral reefs. He then introduced the media investigation to surveillance on protestors by a security farm contracted with the Japanese government. He and his colleague revealed the confidential list of protesters prepared by the private security company. Since the list included the protestors’ personal information which could not be collected by a private company, the involvement of the government and the police is suspected. The security farm used the list to report to the government about the protest activities at sea. He then touched on the difficult situation which the Okinawan media are facing. Due to their watchdog role on the authorities, the Okinawa Times and the Ryukyu Shimpo, two major newspapers in Okinawa, are repeatedly attacked with hostile comments by top ranking government officials. He shared some examples of such oppressive comments by: Mr. Yoshiro Mori, then-Secretary General of the ruling Liberal Democratic Party (LDP); Prime Minister Abe; and the Prime Minister’s close friend Mr. Naoki Hyakuta. 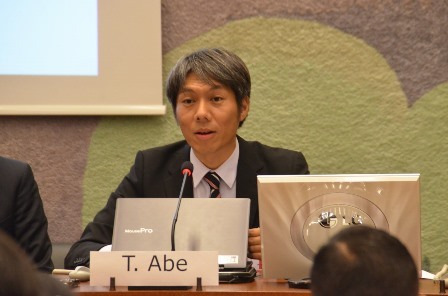 He described that those comments fuelled groundless attacks against the Okinawan media, especially on the internet. Moreover, he introduced some examples of physical restrictions imposed on the media in Okinawa. In January 2015, a coast guard restrained a female cameraperson on a boat in Henoko when she was filming the protest. In August last year, riot policemen prevented two journalists from reporting the protest scene for up to 15 minutes, even though they showed their media IDs in Takae. They were from the two Okinawan newspapers. He also shared his own case which he was thrown away by a U.S. Forces guard in front of the Futenma Air base gate in September 2012. He pointed out that the access to information becomes severely restricted when the U.S. Forces are involved. In December 2016, due to the request from the U.S. Forces, journalists were prevented from reporting the site where an Osprey aircraft crashed. He raised concerns that the Japanese police did not resist the request to protect the access to information. Concluding his remark, he shared concerns that Okinawa is likely to be the first place for arrest of a journalist to take place in Japan, because the local media are intentionally isolated and divided from the mainland media. 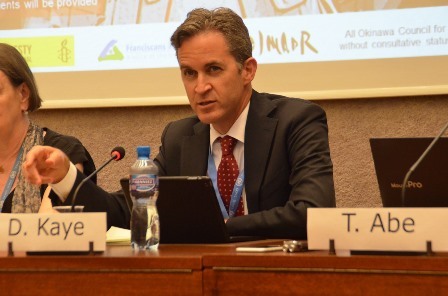 In his intervention, Mr. Kaye addressed three different topics: the role of special procedures and communications; his country report on Japan ; and the joint report on the “proper management of assemblies” by the Special Rapporteur on the rights to freedom of peaceful assembly and of association and the Special Rapporteur on extrajudicial, summary or arbitrary executions. On the first topic, he stressed that his role is not to take a position on the merits on any particular dispute, but is to monitor the existence of space for individuals to conduct their protests and to monitor in what extent the State interferes in freedom of expression. In the joint communication on Mr. Yamashiro’s case, he emphasized that the Special Rapporteurs simply communicated with the Japanese government to initiate a dialogue on their questions based on the information received. He encouraged civil society to use the communications procedure when there are concerns in the area of human rights covered by a mandate holder. He also emphasised that the special procedures can be a tool for civil society to get information from the government when the access to information is felt limited. Regarding his visit to Japan, he clarified that he did not go to Okinawa but meet with people from Okinawa. While commending on the country’s open space for demonstration in general, he shared his view that the situation in Okinawa is different due to following reasons: engagement of a foreign government; national security issues; and significant impacts on the people of Okinawa. He therefore considered that it is natural to have passionate demonstrations in Okinawa. In this light, he urged the Japanese government to ensure an open space for demonstrations in Okinawa. He further addressed the question on proportionality of the measures taken against protesters. He acknowledged that individuals are detained for a short time and released for most of the cases, but Mr. Yamashiro was detained for 5 months with the denial of access to his family. He raised the issue of proportionality for the case. He shared concerns that the disproportionate measures imposed on Mr. Yamashiro may influence and deter the protest. He reminded that every government has an obligation to create a space for protest. Concluding his intervention, he expressed a hope that a dialogue with the Japanese government could be opened by his report and the joint urgent action. He encouraged everyone to study the joint report on the “proper management of assemblies”.